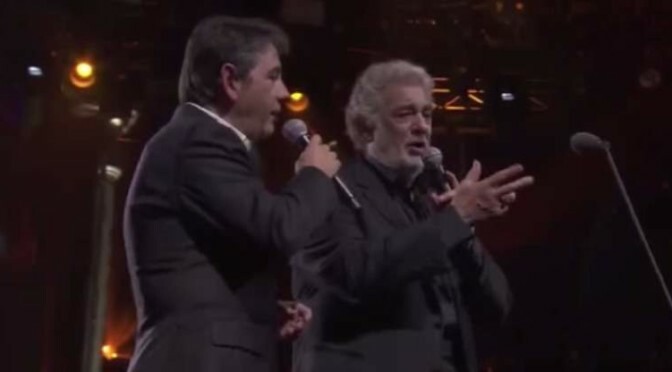 The legendary Spanish tenor Plácido Domingo and his son, Plácido Domingo Jr. in duet sing “Perhaps Love”. The closing of the ITunes Festival 2014 at Roundhouse, London. “Perhaps Love” is a song written by the American singer-songwriter, actor, activist and humanitarian John Denver (December 31, 1943 – October 12, 1997). It was addressed to his wife Annie Martell (the eponym of his #1 hit “Annie’s Song”) while they were separated and moving towards a divorce. In an interview the day after Denver’s death, Annie said that this is her favorite song of his, rather than Annie’s Song (which she also said she enjoyed). The song was recorded as a duet by John Denver and Plácido Domingo and appeared on Domingo’s 1981 album of the same title. The orchestra on the track is conducted by Lee Holdridge. The video below features the 1981 recording of song “Perhaps Love”, sung by John Denver & Plácido Domingo.